New Delhi, April 17: BJP president Amit Shah trained guns at his TMC counterpart Mamata Banerjee, after the video a Trinamool lawmaker allegedly promoting violence went viral on social media. In the footage, Chakdah MLA Ratna Ghosh Kar is heard asking party cadres to "chase away central forces". 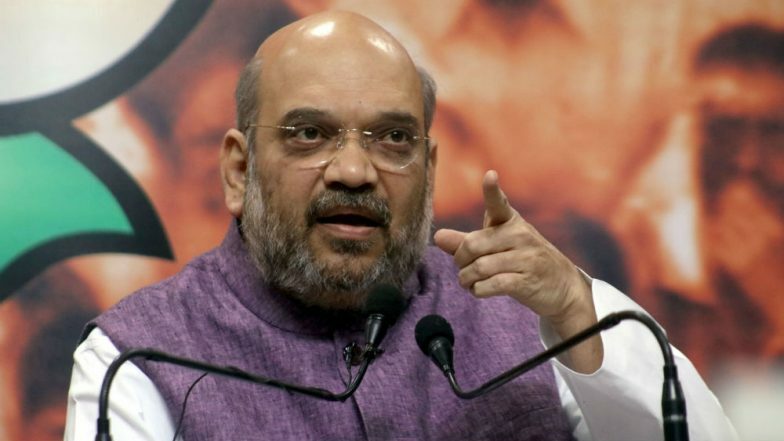 Shah put the onus directly on Mamata for the contentious statements by her legislator, saying that her "trusted lieutenant" has proved that the TMC believes in the "idea of violence and anarchy". MHA Frowns After Bangladeshi Actor Ferdous Ahmed Campaigns For Trinamool in Raiganj. Further lambasting the West Bengal Chief Minister, Shah said her party has destroyed democracy in the state. But, added the BJP chief, Mamata's "time is up" and she would be soon driven out of power. "Finally, Mamata didi’s trusted lieutenant accepts that her party believes in the idea of violence and anarchy. But I want to remind Mamata Didi that such destruction of democracy won't last long. People of Bengal will vote out TMC at the hustings. Her time is up," Shah said. "I will go to each and every booth and we will not care about the central forces...and if the central forces are pro-active, I will request the Mahila Morcha members to pick up broomsticks and chase them away from our area," she said in Bengali. The TMC lawmaker's speech, on Tuesday, comes two days before the second phase of Lok Sabha elections 2019. Three crucial seats - Darjeeling, Jalpaiguri and Raiganj - will be contested in the polls to be held tomorrow.